Cacharel will launch a duo of limited edition summer fragrances this month. 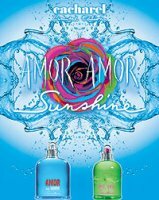 Amor Amor Sunshine for women includes apricot nectar, pink grapefruit, mandarin, bergamot, peony, orchid, tiare, musk, sandalwood and vanilla. It will be available in 50 and 100 ml Eau de Toilette. Other upcoming releases from Cacharel: Liberté. Also see a review of the original Cacharel Amor Pour Homme.